Advised the company on the acquisition of Media Corp Ltd in Glasgow. We advised a large NI company on its debt refinancing (circa £45m) and buy-out of a minority (25%) shareholder. We advised Irish Life Plc on the acquisition of a strategic majority shareholding in Invesco Ltd.
We advised Irish Life Plc on a significant investment for a shareholding in a new GB based start-up venture. Advised on the acquisition Mind Click Ltd in Nottingham & Brighton. Advised on acqusition of minority shareholder stake in the business by the other existing shareholders. This was allied to a refinancing of the business. We advised Towergate Insurance Ltd on their acquisition of Dawson Whyte Ltd, a leading insurance brokerage firm in NI with 5 branches. We advised Golf Holdings Ltd (Parent company of Winemark) on the acquisition of Holywood & Donnelly from C&C plc. Beltrae Partners acted for the management buy-in team who acquired the business in 2009. This role included raising all the necessary debt and equity finance to fund the purchase. MediCare Pharmacy Group acuqired Dundee Pharmacy Group (sum undisclosed). Beltrae Partners advised MediCare on this strategic acquisiton for the NI pharmacy sector. The deal completed in June 2008. BT plc acquired BIC Systems for £17m. 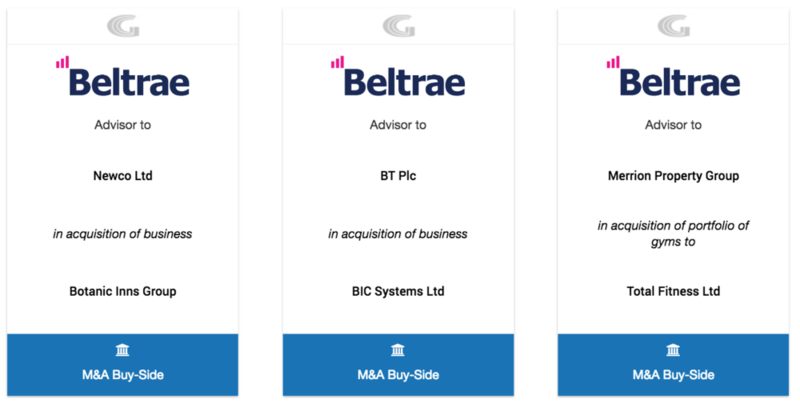 Beltrae Partners advised BT plc on the acquisition, including initial approach, valuation and strategic negotiations. 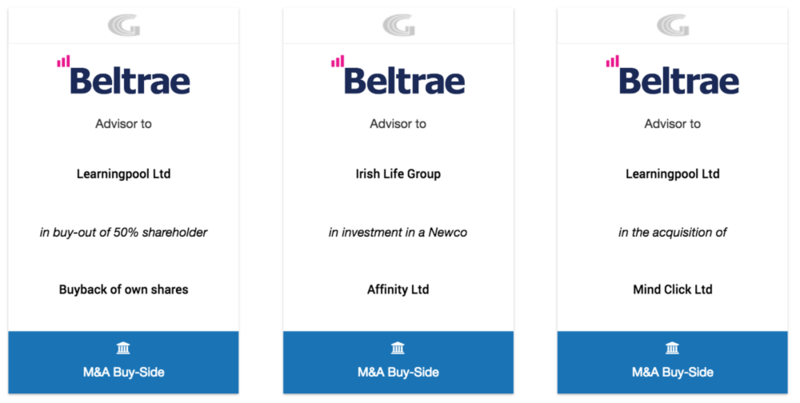 Beltrae Partners aquired, on behalf of an Irish property investor, a large property portfolio in the leisure sector. Beltrae jointly identified the opportunity and led the negotiations with the vendor and raised the bank funding to aquire the portfolio in a deal size in excess of £140m. Beltrae Partners advised Golf Holdings the parent company of Winemark on their successful aquisition of Russell Cellars' chain of off licences and convenience stores. (sum undisclosed). Beltrae Partners advised Glover on the acquisition of Discovery Drilling Ltd in Essex, England. Beltrae Partners advised McMullen on their first acquisition in GB, when they acquired Systems Aluminium Ltd in Glasgow. We advised BT PLC in its aquisition of Dunmorris Ltd. a mobile phone retailer. Beltrae were involved from initial target identification through to completion. Beltrae Partners advised Merrion Property Group on its aquisition of Down royal Golf Course and associated land which is leased to Down Royal Race Course. Beltrae Partners advised a management buy in candidate on acquiring a strategic holding in the partial buy out of the NI4Kids publication. Beltrae Partners advised Glovers on its acquisition of Ground Resources Ltd which is based near Bristol, England.